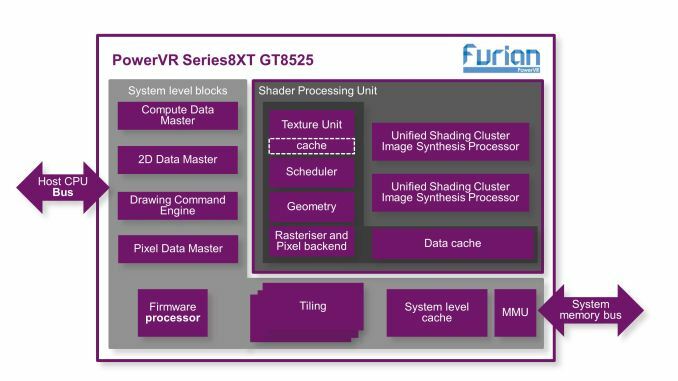 Back in March of this year, Imagination announced their next-generation GPU architecture: Furian. Their first new architecture since Rogue in 2010, Furian iterates off of what Imagination has learned in the intervening years to further improve their architecture’s performance, power efficiency, and die area efficiency. 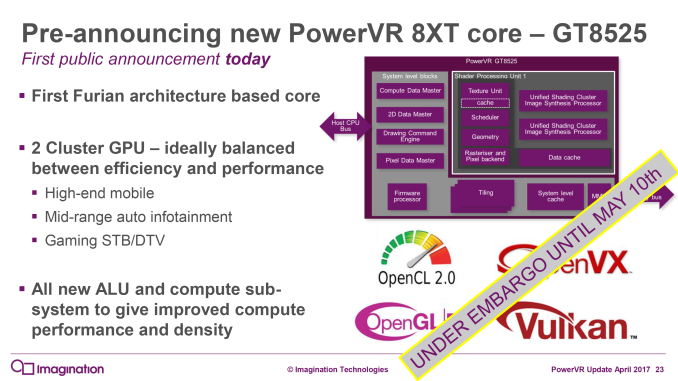 At the time the company only announced the architecture and not any GPU designs based off of it, but today they are taking the wraps off of the first Furian design: the PowerVR Series 8XT GT8525. With their first design, Imagination is taking the pragmatic route – or as they like to put it, the balanced route. 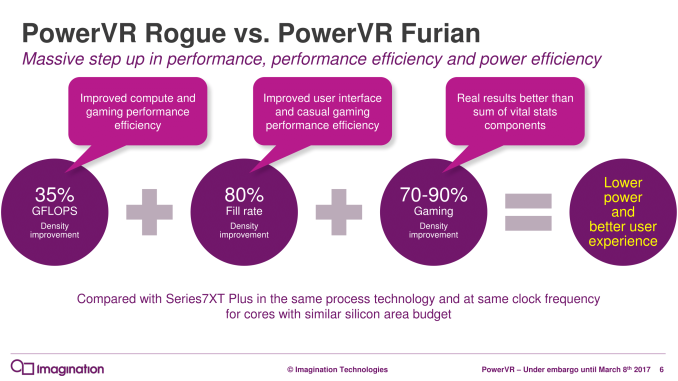 Outside of Apple, most of Imagination’s customers have been licensing two cluster designs from the high-performance PowerVR families (6XT, 7XT, 7XT+), so this is where Imagination is starting for Furian and the new Series 8XT. By and large then, the GT8525 is exactly what you’d expect for a 2 cluster design based on Imagination’s earlier disclosure. 2 clusters are by design intended to fit inside of one of Imagination’s shader processing units, giving the design a single such unit. The significance of this choice, besides being the smallest possible full implementation of Furian (before you start removing pieces from the design and get fractional) is that one of the areas Imagination focused on was improving the pixel and texel throughput at this level. As a result, a 2 cluster Furian design offers 8 pixels and 8 bilinear filtered texels per clock whereas a 2 cluster Rogue (e.g. GT7200) offered 4 of each. So even though it’s still only 2 clusters, even after you ignore the architectural improvements, there’s actually a lot more hardware working in a 2 cluster design. By the numbers, Imagination is touting some rather significant performance improvements for GT8525 over its predecessor, GT7200. 50% faster performance in GFXBench Manhattan, 80% faster in GFXBench T-Rex, 50% more (on paper) FLOPS, etc. All of this would be at equal clockspeeds, though the company isn’t talking about power consumption or die size right now, so it’s hard to get a feel for where energy and area efficiency of the new design stands. With this 2 cluster design, Imagination is going to be pursuing a mix of markets, though ultimately it’s up to SoC venders to build suitable SoCs. This includes smartphones, of course, but also mobile VR, which is a growing market that has a lot of potential for GPU vendors like Imagination given the performance requirements. The company is also pitching the new GPU design for the automotive market, where along with infotainment duties, a 2 cluster design should be powerful enough for some light ADAS work (presumably just doing computer vision on one or two camera streams). To that end, the company has also announced that the design has already been delivered to their (unnamed) lead customer. Traditionally this would be Apple, but of course we know that Apple will be rolling out their own GPU architecture starting in the next 1-2 years. Instead this could be the likes of MediaTek or another at-large SoC vendor. In any case it’s possible we’ll see the devices using this design in 2018, though it’s ultimately up to the SoC vendor and device vendor on how quickly they want to move. More broadly speaking, Furian and the GT8525 will be a critical product for Imagination. As the company announced last week, they are doubling-down on their GPU products and selling off everything else. Without Apple, they need to capture a larger part of the GPU market share in smartphones and other embedded devices. Consequently, starting with a 2 cluster design is the smart choice here, as 2 cluster designs are going to have the highest volume.